person responsible for this crime. 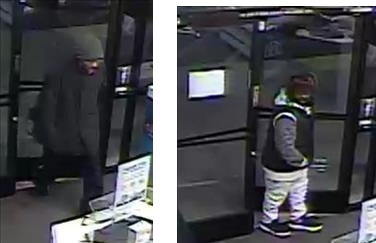 On January 28, 2019, at 9:55 PM, the suspect waited several minutes for customers to leave the Chevron Gas Station at 2499 Northgate Boulevard. Once the store was empty, the suspect entered the store and ran straight to the cash registers and counter. The suspect immediately presented a black handgun at the clerk and demanded money. After getting cash, he ran out of the store westbound on West El Camino Avenue. The suspect is described as a Black male adult in his mid 20’s, 5’ 09” tall, weighing 150 to 170 pounds, with a skinny build. He wore a black sweater, black pants, black shoes, and a black face mask. He carried a black handgun. On January 27, 2019 at approximately 6:18 pm, the California Highway Patrol (CHP) received reports of a traffic collision on Walerga Road at Big Cloud Way. It was determined that an SUV and a motorcyclist, who was riding a 2006 Honda Shadow motorcycle, were traveling southbound on Walerga Road when a collision occurred between the two parties. CHP and Sacramento Metropolitan Fire Department personnel arrived on scene and discovered the motorcyclist, a 27 year old man from Foothill Farms, was deceased from the collision. The driver of the SUV immediately fled the collision scene and has not been located. The SUV has been described as a newer model large black SUV similar to a Cadillac Escalade or Chevy Suburban with tinted windows and possible damage to its right rear. The El Dorado County Sheriff’s Office is seeking the public’s help in identifying the suspects responsible for this crime and/or the victim’s vehicle. On Dec 18, at about 8 PM, the El Dorado County Sheriff’s Office responded to a residence in El Dorado where 60- year-old Helen Hoover (McKinney) was found deceased in her residence. An autopsy was performed, and it was determined that Hoover (McKinney) died as the result of Blunt Force Trauma and her death has been deemed a homicide. During the investigation, it was found that there was no forced entry to the home and her vehicle was missing. Hoover’s (McKinney) last known contact with family or friends was on November 29, 2018. Her vehicle is described as a 2017 Nissan 370Z, California license place 8CSX032. It is white with black convertible and black rims. UPDATE: Jan 15: Victim's vehicle has been found in Sacramento. We are also hoping to find information on Hoover (McKinney's) whereabouts between November 29 and December 18. On October 30, 2018, at 11:38 PM, the victim and his ex-girlfriend arranged to meet at America’s Best Value Inn on Massie Court. Once inside the room, the girlfriend pepper-sprayed the victim and then opened the door, letting in three suspects. Once inside the room, the suspects physically assaulted the victim and stole his property. They were driving a dark blue 2010-2014 Kia Sedona. Suspect #1: Black male adult in his late teens to early 20's, thin build, approximately 5'08" to 5' 10", black hair, short approx. 2-3" long twisties, wearing a black hoodie, black pants, and black shoes. 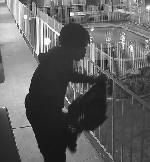 Suspect #2: Black male adult in his late teens to early 20's, thin build, approximately 5' 08" to 5' 10", wearing a red hoodie under a black jacket, black pants, and grey shoes. persons responsible for this crime. On Friday December 7, 2018, at approximately 11:10 PM, the Sacramento Police Department responded to a five-round Shotspotter activation on the 5300 block of 48th St. Officers arrived on scene and located the victim laying on the front porch of a home with four gunshot wounds. The victim advised that he was riding his skate board home when a black Honda approached him and shot at him. He also advised that he saw the shooter at the World Wine and Liquor store right before the shooting occurred. The victim was transported to a local hospital and is going to survive his injuries. Surveillance footage was obtained from World Wine and Liquor of the suspects and the suspect vehicle. The vehicle appears to be a dark-colored mid 2000's Audi A4. On October 23, 2019, at approximately 5:05 AM, Samuel J. Treas, 54,(pictured above) was crossing the street at Stockton Boulevard and Jensen when he was struck by a hit-and-run driver. Mr. Treas was crossing with the light and was in the crosswalk. The vehicle was a 2013 to 2015 black Nissan Altima sedan. The vehicle would have sustained significant damage to the right side and mirror. On December 18, 2018, at 9:21 PM, the suspect entered Domino’s on Greenhaven Drive just before closing. He was armed with a black handgun equipped with a tac-light. The suspect forced the employee to open the register and take cash out of the till. The suspect fled the store on foot. At 10:13 PM on the same night, the suspect laid in wait outside the side door of Little Caesar’s on Freeport Boulevard. When an employee opened the door to take out the trash, the suspect pointed the gun at him and ordered him to open the till and safe. He again fled on foot. The suspect is described as a Black male adult in his 20s, 6’ tall, with a thin build. He wore a black mask covering the lower half of his face, a black pea coat, hoodie, black pants, and black/gray shoes. On November 28, 2018, at approximately 5:32 PM, Suspect #1 entered the AT&T store on Mack Road with a duffel bag and a long screwdriver, demanded to know where the new phones were kept, took 20 brand new Apple iPhones from the safe and approximately $800 cash before fleeing in an unknown direction. Suspect #2 entered the store after the first suspect and stood watch during the robbery. The total loss was estimated to be $20,800. Suspect #1 is described as a dark-complected Black male adult in his 50s to 60s, approximately 5'10" to 6'00" with a thin build and graying black hair. He wore a black pea coat, black pants, black shoes, a grey beanie with an "Alpine" name and logo, and carried a long silver screwdriver or silver bar-type tool and a medium-sized navy blue-colored duffel bag with charcoal gray straps. Suspect #2 is described as a dark-complected MBA in his early 20s, approximately 5' 05" and 120 pounds. He appeared to have medium-length dreads hidden under a fuzzy reddish-brown-colored "dog ear" type hat with red and black plaid fur inside the hat. He wore a black "puffy" vest or jacket with gray sleeves and a light-colored hoodie under the jacket, light-colored pants or sweats, and black athletic shoes with white soles. On May 27, 1993 at during the early hours of the morning Victim Joseph “Junebug” RAY and two witnesses were standing outside near the corner of Roanoke Ave and Clarkson Ct, near Grant High School in Del Paso Heights. A brown 4-door sedan drove by on Roanoke. There were at least three male black adults observed inside the vehicle. When the sedan reached Clarkson Ct, several shots were fired from the sedan which continued driving out of the area. Victim RAY sustained a gunshot wound that left him paralyzed from the waist down. He would live the following 25 years disabled in a wheelchair. A subsequent investigation into the shooting ensued in 1993. Detectives at that time had information to believe that Victim RAY had problems with someone earlier in the night. Detectives had information that someone named “Chief” was involved in some way. However, since the investigation was closed in 1993 there is now limited information regarding this case. Victim RAY died in October 2018. 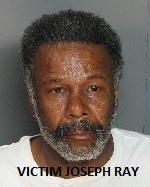 It was determined that the cause of his death was related to his injuries sustained during the 1993 shooting. The investigation was reopened as a homicide investigation. Detectives are hoping that anyone with information related to the 1993 shooting will come forward. Crime Stoppers will provide a CASH REWARD in some cases to those who provide information that leads to an arrest. 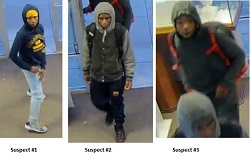 On December 6, 2018, at approximately 4:53 PM, 4 male juvenile suspects entered Berilian Jewelers. Suspect #4 was armed with a silver/black Ruger handgun. Suspect #4 jumped over the front counter and was tackled by the victim. A struggle ensued between the victim and Suspect #4, and the victim was able to take the firearm from Suspect #4. Suspect #3 was observed placing unknown items into a backpack. Suspects 1, 2 and 3 fled from the store prior to officers’ arrival. Suspect #4 was detained by the victim until officers arrived and took him into custody. The firearm used by Suspect #4 was recovered. Suspect #1 is a Black male juvenile, 16-17 years old, 5’ 07” to 5’ 09”, with thin build. He wore blue-hooded sweatshirt with yellow text (possibly Aeropostale), yellow do-rag, light blue jeans, and gray sneakers with yellow laces. 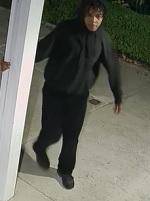 Suspect #2 is a Black male juvenile, 16-17 years old, 5’ 07” to 5’ 09”, with thin build. He wore a black backpack with white Puma logo, dark gray/light gray hooded sweatshirt, black sweat pants, and black sneakers. Suspect #3 is a Black male juvenile, 16-17 years old, 5’ 07” to 5’ 09”, with thin build. He wore a black and red Jordan brand backpack, dark gray hooded sweatshirt, dark gray sweat pants, and black sneakers.